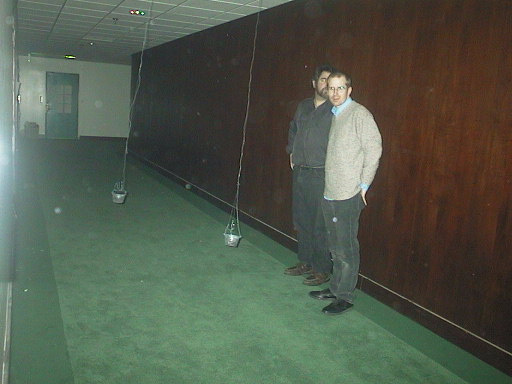 This was an improvisation that Larry Polansky and I did at the CalArts CEAIT Festival in 2000. Larry was tweaking the settings on his Killing Time software, and I was improvising with my fergie software, which I controlled via two flashlights taped to my head. It was a classy gig! Larry says: "Killing Time was an experiment in two things, harmonic series related tuning software, and the notion of a fixed time-span that gradually gets sub-divided and "filled in" in a variety of ways (similar, in principle, to my piece called Ensembles of Note). The Java/Jsyn software for Killing Time allows for some improvisation using these ideas (including structural detunings of the harmonic series, some "rhythmicana" type notions, and some other things)."